Arnold Schwarzenegger is driving trough the town in Hummer on which side is written “Terminator”. Perhaps is this American actor entered in the late years of life, but he does not give up its tough guy style. Recently, we have just find out from Arnold that in his collection of cars, despite the large number of Jeep models, is a tank. Now we see the former governor of California in Hummer, which is a special designed for him. 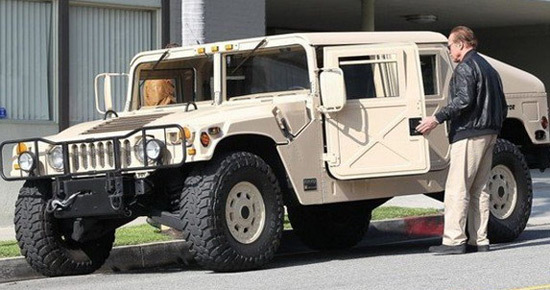 The civilian version of the Hummer first appeared in 1992, as a revised version of the model M988 Humvee. But since this model did not go well in the market, the factory has added air conditioning, stereo sound system, lots of wood detail, improved command-board and much more. 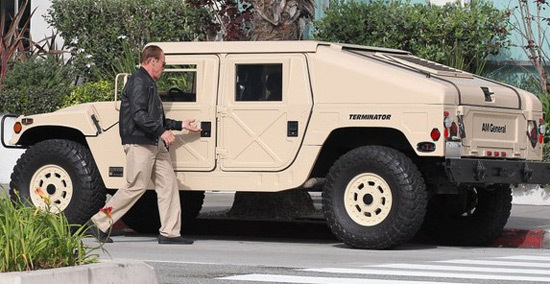 Although Schwarzenegger, who has sixty years, has a few problems when leaving the vehicle, we have to admit it’s pretty cool that he wrote on his Hummer “Terminator”.